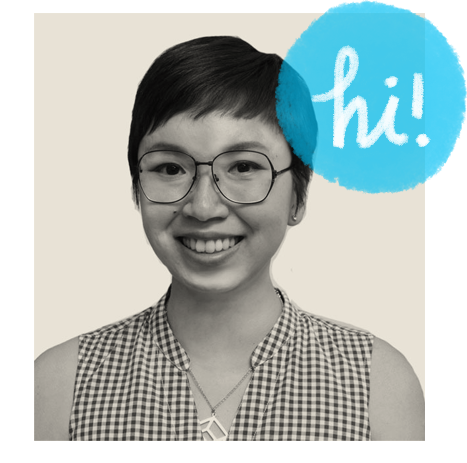 I’m thrilled to announce that the second grant receiver of Pikaland’s grant on Society6 is Aijung Kim, who is already making a mark on the zine world, along with her other works in art and illustration. 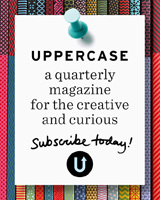 She’s also one of the many artists who dispensed great advice in the latest Good to Know zine. I am an artist currently living in Richmond, Virginia. I studied Printmaking at Pratt Institute, and have always had a love for multiples – prints, books, craft objects. I love to write, and I am very drawn to narrative in both writing and art, because I like to see the relationships and complexities that weave through an image or story. At the moment, I’m in a bit of a transitional stage. When I moved to Richmond four months ago, I had trouble finding a job. At some point I sort of gave up and decided to try to make a living solely from my art, which is both thrilling and scary. It’s always been hard for me to have the energy to make art when I had a day job. Now I feel like I have a lot of catching up to do! I have lots of new ideas and a backlog of old ones that I never had a chance to work on. I’m not sure exactly what direction I’m headed in, but I’m sure I will be making more prints, crafts, and lots of little books. I loved to write and illustrate stories since I was a child and often made them into little hand-bound books to give as gifts. My art has always been a bit cartoony and illustrative, and has a graphic quality to it even when I’m not intending it to. I took mostly fine art classes in college, and didn’t take any illustration classes except for a Sequential Art class, which was great for giving me a taste of what it’s like to make comics, (aside from the first comics I drew when I was 11 years old.) A couple years ago, I formed a “Comix Club” in Rochester, New York where I was living, and met some new friends with similar interests to share comics and draw. 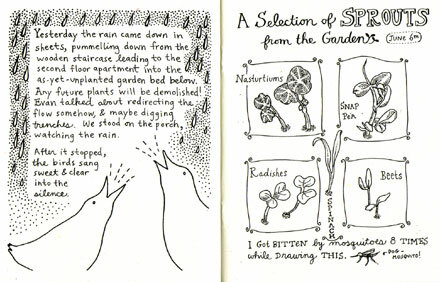 That’s when I started making my first zines – little illustrated books of poems I wrote. Zines remain very important to me because I can turn my ideas into small, finished books using simple materials – paper, ink, white-out, and then on to the copy machine. I grow and learn from each little book I make, and their smaller scope makes the task of finishing them less daunting. They are also good practice for me to eventually make a larger, more polished work. I’ve always thought it’d be amazing to illustrate children’s books. 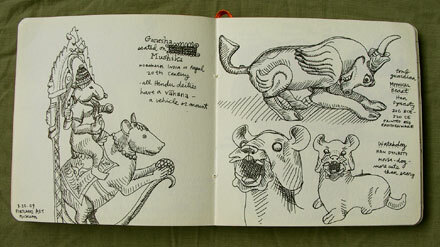 When I was in high school, my sketchbooks were more beautiful than they are now. 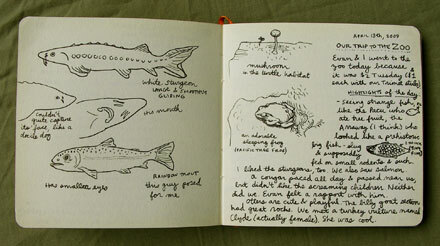 I spent a lot of time drawing and writing in them, and the sketchbooks were very personal to me. Nowadays, I use my sketchbooks mainly to work out ideas, and sometimes for writing and observational drawing – I decided I really needed to get my drawing skills back in shape! My inspiration comes from the details that make life real and beautiful to me – the shape of a leaf, how it feels after a rain, the everyday particulars. I love checking on the progress of my garden and seeing how the flowers and vegetables grow and change gradually. I am also getting more into the diversity in nature – sea life, for one thing. I did a couple of illustrations for a friend who’s starting a school for underwater filming and conservation education. As I researched about fishes, I started to realize how crazy the underwater world is and how amazing and adaptable animals are. The other day I found a webpage about different types of beetles, and once again I was amazed at how beautiful and overlooked these creatures used to be to me. There’s no shortage of inspiration! 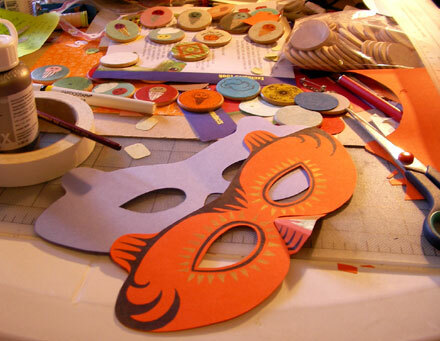 I am also inspired by toys and games, paper puppets, masks, divination cards, children’s books, comics, and tons of other artists and writers. 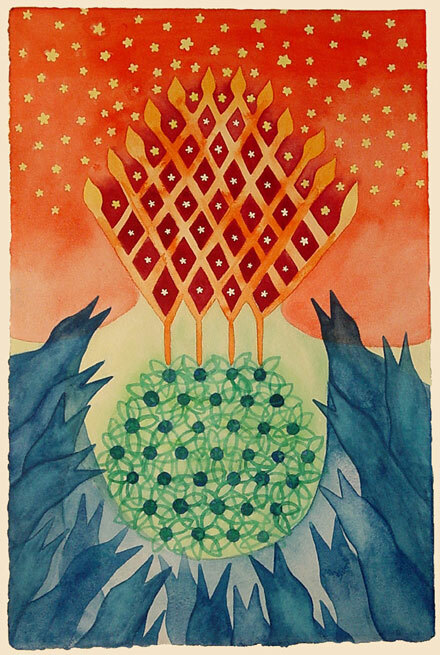 Some of my favorite illustrators include Edward Gorey, Tove Jansson, Henrik Drescher, Peter Sis, and Corinne Mucha. I also have plenty of talented artist friends, and it seems I discover new artists everyday while browsing the internet. It’s hard to think of all the artists who have inspired me, since I feel like they’ve invaded my blood stream and are a part of me. On the flip side, if I look at too many things for inspiration, it keeps me from making my own art. My mind gets boggled with ideas and I have trouble focusing. I become discouraged when I see other artists around my age who seem to be much more prolific and successful than I am. I have to remind myself that everyone is different and I shouldn’t compare myself. I can only be myself, no better or worse. The best thing is to just keep working! When I feel doubtful about my art or the direction I’m heading, the best thing is to switch to another project for awhile until the fear subsides. Or take a small break and go for some fresh air. My best motivator is having a deadline. If I have an art show or craft fair coming up, I can focus on what I can get done in time. I think my biggest stumbling blocks are my own doubts and my ability to become distracted, so having some sort of outside pressure helps motivate me. When I feel REALLY unmotivated, I talk to my boyfriend, friends, and family. Everyone has been encouraging of my art, and I simply would not be in the place I am now without their support. I come from a family of artists, inventors, and entrepreneurs. My parents run three businesses – they are hard-working and not afraid to take risks. My mom gives me emotional support and helps me figure out practical matters. My dad is more of a “wild card” who reminds me to trust that the Universe is supporting me in whatever I do. When I’m feeling down, he always tells me “Just do your art,” and he won’t let me to talk about my doubts. I could go on and on about everyone who inspires and motivates me. They all have their struggles, but they are able to deal with whatever comes along, which I think is courageous. Also, I noticed that every time I feel discouraged about something, some good thing comes along to give me some hope (including the opportunity to do this interview!) Somehow, this never fails. I guess that’s the trust that my dad was talking about. I love my Rapidograph technical pens. I like the fact that they’re refillable (it seems so wasteful to throw away a pen), and the lines come out so smooth and nice. They inspire me to draw! I’m not sure if I have a message to tell people that’s not already apparent in my art, but I would hope that people find a bit of inspiration in what I make, enough to make them pause and feel something. I make different sorts of things for different purposes, and I think I have both light-hearted and serious aspects to my work. In my zines, I generally focus on the beauty of nature, human emotions, and simplicity. Some people have told me that my zines inspire them to make their own little books, and I love to hear that. I think everyone should be able to create, whether they feel like they are an “artist” or not. I’m making more zines – currently making drawings for a little zine about going to the park, and continuing with Minutiae No. 3, a serial about my everyday occurrences and observations. I’m also at different stages of several projects: pins and jewelry using cut paper collage, paper Halloween masks, and a deck of symbolic cards that may be used like a tarot deck or simply for inspiration – something I’ve wanted to do for a long time. It’s hard to say, since it seems like I never know what is going to happen. I moved back and forth across the country twice in the past year, and I’d like to settle in Richmond for awhile and make art. But my boyfriend and I want to move to New Mexico in a couple years, so one day I hope to be there – making and selling my arts and crafts, enjoying the beauty of the land, and learning from the cultures around me. I’d like to exhibit in more art shows, and work on a children’s book or a graphic novel. I would also like to set up my own printmaking studio. What was the one advice that you would like to share with fellow artists? Try not to be swayed too much by the ups and downs. I used to think that if things went well for me, it meant I was moving in the right direction. Now I realize the mistakes were integral to building my character and understanding what works and doesn’t work for me. While new opportunities are exciting, they eventually fade into the duty of sitting down at your desk and working. So keep strong and anchor yourself in your work. Also, while I think it is important to develop regular work habits and practice discipline, I think many artists underestimate the importance of rest and inactivity. I mean those frustrating times when you don’t seem to know where to go next. I think every artist has their own internal seasons. Not every day can be like spring with flowers blooming. There must also be wintertime, when things go underground and sleep for awhile. I’ve learned for myself that artist blocks are a way of showing you that something is changing inside – it just hasn’t decided what shape it’s going to be. Just be patient and focus on other things in your life that may need attention. You will find a solution when you are ready. For those of you who are beginning your art careers, I think confidence is an important element in achieving your dreams. You can “pretend” to be confident even if you don’t feel like you are – kind of like putting on a Halloween costume and embodying the character. It’s okay to pretend you are as great as you hope to be. One day, you will become it. i love aijung’s work and am collecting her zines. she is as delightful & engaging in person as she is in this interview. many thanks! so glad that she’s a grant winner, too! Great interview! 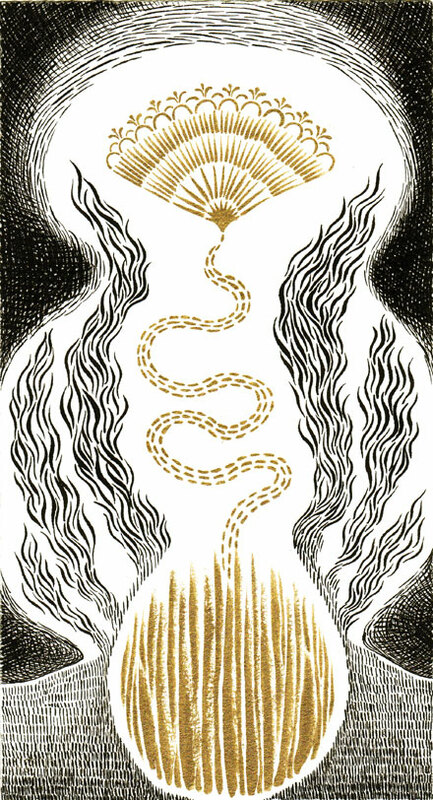 Aijung’s drawings and books are so lovely and I’m proud to be a collector of her work as well. I am a really big fan of this wonderful artist and have been for a long time. 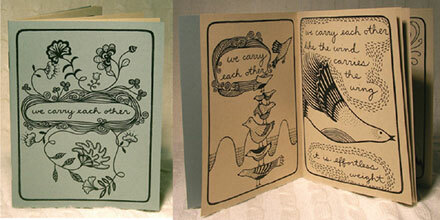 I believe that her zine “We Carry Each Other” will one day become a household classic. Her work is always so fresh and creative and always continues to amaze me. Congratulations, Aijung. ooooo!!! Huge fan of the “We Carry Each Other” ‘zine. So beautiful. I will need to own an original Aijung soon.